Father’s Day is right around the corner, and some of us might not recognize that it is actually an international holiday. Have you ever wondered how other countries celebrate Dad’s special day? In Mexico, just like all other “fiestas” and holidays, they celebrate Father’s Day on a more festival scale then we do here in the States. Here are a 4 important things that you should know about the celebration of Father’s Day in Mexico. The Mexican people not only honor their fathers on the third Sunday in June every year, but they also look to father-like figures. For example, they honor grandfathers, step-fathers, big brothers, and other important men in their lives. 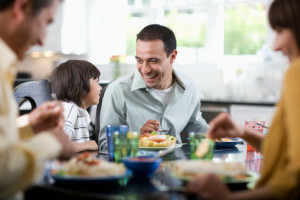 In Mexico, people show their thanks to their fathers by giving them gifts, such as greeting cards and ties, similarly to people in the United States. One big difference of celebration is a race that is called “Carrera Día del Padre 21K Bosque de Tlalpan.” This is an annual race that takes place on Father’s Day in Mexico City. It is a bonding opportunity in which fathers and their children can spend a day outside running a road race side by side. Just like almost every other festival and holiday that is celebrated in Mexico, food has an important role in the celebration of Father’s Day. Early in the morning there is an enormous meal prepared that includes all of Dad’s favorite foods. And you can’t forget about dessert! The meal is finished off with Mexican chocolates or the traditional dessert of pan dulce. Pan dulce is sweet bread with delicious toppings. Mexican people traditionally have found family quite important. The Mexican tradition has strong foundations in the idea of unity within the family. Father’s Day in Mexico is a time for the family to spend time together. This is an important day of the year for all because they have the opportunity to honor the important men in their lives. Mexico always has some of the best celebrations in the world, and as you can tell Father’s Day is no different. If you still have no plans for Dad on June 15th, come and treat him to a huge Mexican meal and desserts at Acapulcos Mexican Family Restaurant and Cantina. Visit one of our many locations throughout Massachusetts and Connecticut!